WTI crude prices have continued to weaken, and they are in the $47.00-$47.50/b range this morning. WTI opened at $47.40/b today, a decline of $0.31, or 0.65%, below Monday’s opening price. 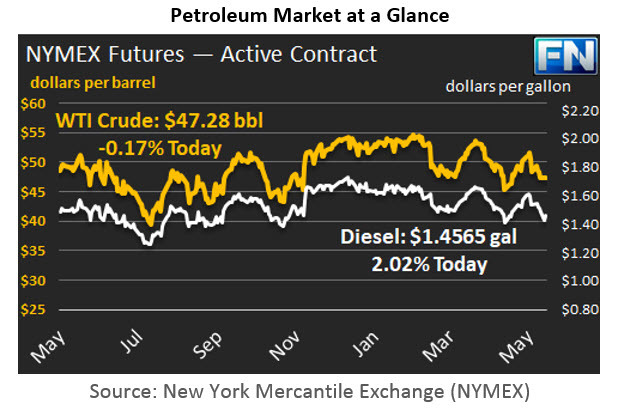 Current prices are $47.28/b, a decrease of $0.12 below Monday’s closing price. Diesel opened at $1.4594/gallon this morning. This was a drop of 2.41 cents (1.62%) below yesterday’s opening price. Current prices are $1.4565/gallon, down by 0.28 cents from yesterday’s closing price. Gasoline opened at $1.539/gallon today, a significant drop of 3.8 cents, or 2.41%, from yesterday’s opening. Prices are $1.5353/gallon currently, a decline of 0.28 cents from Friday’s close. Markets overall appear to be in a cautious state, with several risk events this week, including three key events on Thursday: The European Central Bank (ECB) meeting; the United Kingdom ‘s Parliamentary Election; and former FBI chief James Comey’s testimony before the U.S. Congress. Investors are looking to safe havens such as gold, Treasuries, and the Yen until the results are out. The EIA has released data on gasoline and diesel retail prices for the week ended June 5th. At the national level, gasoline retail prices rose by 0.8 cents/gallon. Diesel prices declined by 0.7 cents/gallon. Prices have weakened since the OPEC-NOPEC meeting on May 25th, and this is reflected in last week’s retail prices. If prices continue to ease, it is likely next week’s retail prices will continue to decrease. Gasoline pump prices averaged $2.414/gallon during the week, a mere 3.3 cents above last year’s price for the same week. Given this week’s downward trend in prices, next week’s retail gasoline prices could be even cheaper than they were last year. Details follow in our second article.